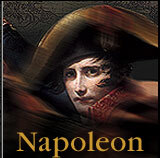 The Napoleon Web site features are designed to work best with any browser version numbered 3 or higher (Netscape Navigator 3.0, 4.0 or 4.5 or Microsoft Internet Explorer 3.0, 4.0 or 5.0). If you still have a version older than these, you will need to upgrade it. Both Microsoft Internet Explorer and Netscape are free downloads. Any computer hardware that runs your preferred web browser software will work, but the faster it is the better it will run. The faster your modem or other connection (WebTV or other broadband service), the better the experience will be, as pages will load faster. Plugins are additional software that allow your browser to do interesting, extra stuff, like play sounds or movies. You will need a decompression utility to view the screensaver. For the Mac try StuffIt Expander. For PC try WinZip. You'll need the ShockWave plugin and the ShockWave Flash plugin. Both are free downloads. To view any of our video clips, you'll need to have the RealVideo plugin, which is also a free download.